Few engineers can claim to have contributed substantially to so many different architectural movements as Anthony Hunt. He worked on hundreds of buildings across a period of history that saw architectural fashion undergo repeated radical changes, from the British Modern Movement through High Tech and Postmodernism, right up to today's trend for super-budget landmark buildings. His relaxed command of structural analysis, his appreciation of fine detail and his ability to identify and express key components using approporiate technology set him apart from his peers. A lifelong practise of hands-on prototyping and modelmaking were central to Hunt's design excellence, as it had been for figures like Charles Eames and Jean Prouvé. His exquisite detailing and industrialised methods continue to be widely copied. Hunt lectures regularly in the UK, Europe, USA and Canada. 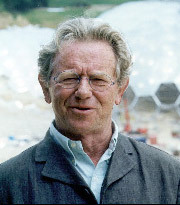 He is a Fellow of the Institution of Structural Engineers (and a 1995 Gold Medalist), an Honorary Fellow of the RIBA and holds Honorary Doctorates from the Universities of Sheffield (1999) and Leeds (2003), and the Royal College of Art (2012). He is a Visiting Professor at the Universities of Pennsylvania, Sheffield, Birmingham, Chinese University of Hong Kong and IST Lisbon.